George Ford is recorded as my Great Grandfather. George was married to Ellen Jane King in 1888 at Beenleigh Queensland. George Ford was born about 1st February 1851 in Paxton Village in the Civil Parish of Hutton, Berwick-on-Tweed, Berwickshire, Scotland. His father was John Ford (#2) a farmer, butcher, grocer & storekeeper and his mother was Jane Guthrie. They were married on March 12 1847 in the one street village of Allanton in the Parish of Edrom, Berwick, Scotland. John Ford (#2), in turn, was the son of John Ford (#1) and Cecilia Dickson who were married 22 January 1814. John (#1) was born Hutton 11 May 1784 and died 5 December 1872 aged 88. The 1891 census shows the same information with all three ten years older, as expected, but this is the last we find of daughter Cecilia, who was 30 unmarried. There is no sign of the three Ford grandchildren from Australia at this date. Thomas Guthrie and Jane Guthrie appear to have died at an early age. 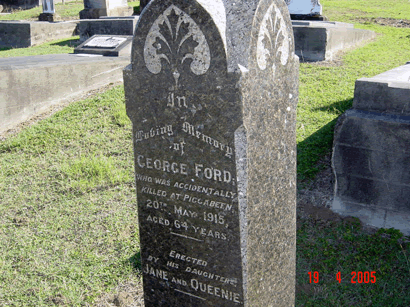 Searches at the Queensland State Archives in August 2005 revealed two possible immigration records for our George Ford. The first is on 6th June 1878 from Greenock, Glasgow, Scotland on the 1080 ton "Rodell Bay" which carried a George Ford, aged 27, an "assisted" passenger, to Brisbane arriving 27th August 1878. The Captain was Mr. Lindsay and Matron Miss Neill, George was in fact aged 27 as stated. George Ford, a farm labourer from Berwick, Scotland, aged 26, came to Australia a "free" passenger (not "assisted") from the port of Glasgow in Scotland, on the 2,000 ton Clyde line iron steamer "Gulf of Carpentaria" under Captain R. Thompson. This was the steamer's sixth voyage to the colonies but not to Brisbane before. The ship sailed on 10th June 1885 and arrived in Brisbane on 12th August 1885. George would have been 36 in 1885 not 26. It is not known if there were age qualifications to immigrate or travel to Australia at the time which may have made George alter his age. It also may have been a relation of George Ford. This George Ford may have been the son of James and Christian Ford who was 3 in the 1861 Hutton census. fill with water at once, and had 17 inches in her afterhold within 17 minutes. tons of Coal for Port Adelaide. Little more is known about the "Gulf of Carpentaria" however, its sister ship the "Gulf of St. Vincent" has some more information. routes were from the Clyde to the Persian Gulf and to the Gulf of Mexico. of South America. [then more on the company in the 1890s]." The "Rodell Bay" shows a James Ford, also aged 27, in Steerage. It is not known if this was George's older brother James who was born about 1848 and about 3 years older than George. After the announcement to the world that gold and diamonds had been discovered in South Africa, about 1880, George may have headed there. George may have travelled to Australia on a number of occasions to and from the mines of South Africa and back to his homeland in Scotland. George also attended his daughter Jane's marriage in South Africa in 1905 or was he working there at the time. James Ford was the first born to John and Jane Ford and was born in 1848. In the 1871 Census James was 22, living at home and a draper. James appears to have come back to Australia about 1884 (possibly from NZ like his brother John ???) and spent the next 26 years in Victoria until about 1913. James married Jane Anderson on 1 December 1884, he was a Draper from Sydney aged 35, in Moor Street Fitzroy Victoria. 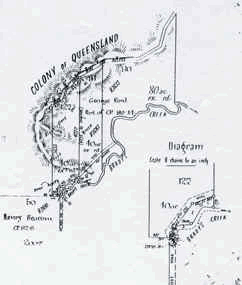 James then spent the next 10 years in Queensland. James died of Heart Failure and Natural Causes on 29 June 1923 at Tweed Street, Coolangatta aged 75 years. John Ford who was born in Scotland in 1857, left home when he was about 17 (about 1874) and moved to New Zealand. He may have remained there for the next 14 years until he was about 31 in 1888. He then moved to Australia where he remained for the next 22 years until he died in Mount Morgan in 1910 at the age of 53. (Died of Bronchitis and Heart Failure between 21st and 30th September 1910). George Ford purchased land at Piggabeen, Tweed Heads, N.S.W. in 1889 and it is noted that when gold and diamonds were discovered in South Africa in 1880 there were workers from England, Scotland and many parts of the world who were intent on making a fortune there. In 1899 war broke out between the Boers and the British Empire and this lasted until 31 May 1902. It is unlikely that George was working there during that war. On Wednesday 14th June 1893, George placed the following advertisement appeared in the Southern Queensland Record. 'My wife, Mrs. Ford, having left her home of her own free will and without my consent, I the undersigned, will not be responsible for any debt she may contract. It is thought that George soon after packed up his children, Jane, John and Cecilia, and headed for Scotland, where he deposited the children with his elderly parents, John and Jane Ford, and then set out for the gold mines at Boksburg. It was said that George took a "wet nurse" to look after the children on the long sea voyage. It is also likely that his wife Ellen Jane Ford and her two daughters Bertha King and Mary Guthrie Ford had moved by this time, possibly to Beenleigh and by 1896 they were in Brisbane where Eva (1895) and Charles Henry Brady (1896) were born. On 2nd October 1888 George married Ellen Jane King in Beenleigh and the next five years until 1893 he was raising his family at Pimpama and Piggabeen. In 1895 Jane, John and Cecilia are in Scotland as that is where John died aged 6 and in the 1901 census Jane 14 and Cecilia 10 are in Paxton Scotland with Grandfather John Ford. George's mother (Jane Guthrie) died 24 November 1900 and his father John Ford died 20 January 1903, aged 80, it is not known what happened to Jane and Cecilia at this point. The daughter of George Ford's sister Elizabeth was Isabella Purves and she was looking after the children in 1901 as disclosed in the census for that year. Isabella was then 22. It is assumed that she continued to look after the children. The year is 1905 and Jane married Thomas Dennison in Orange Free State South Africa and George is present. Cecilia returns to Tweed Heads about 1906 when she is 16 and I assume with George Ford. By this time Ellen Jane has given birth to Eva on 31 July 1895 and Charles is born 25 September 1896 in Brisbane. It is assumed that George now remains in Australia until his untimely accidental death at his Piggabeen forge on 'Paxton Villa' farm on 20 May 1915 aged 64. There was an inquiry into his death as the cash tin had been prized open. George's death certificate is Number 7923/1915 NSW. The last Will and Testament of George Ford was dated 3 March 1911. William Henry Ducat, a farmer of Tweed Heads was appointed Executor and Trustee of his will. The whole of his estate was left in trust to his daughter Jane Dennison (there is no proof that she was his daughter), the wife of Thomas Dennison of Pilgrim's Rest, South Africa and to daughter Cecilia Trembath of Orange Free State South Africa. Jane King (Ford) married Thomas Dennison on 13 December 1905 at Pilgrims Rest South Africa. George Ford was a witness to that Marriage and gave his consent. Cecilia Ford married Joseph Saunders Trembath on 23 April 1911 in St Michael's Church Boksburg Transvaal, South Africa. From information received at Tweed Heads on Thursday night, it appears that a son of Mr. Hulcombe, of Picabean, passing Ford's forge at that place, short dusk, saw Mr. George Ford lying near a horse's heels, as if he had been kicked by the horse. Hulcombe reported the matter to the Tweed Heads police. 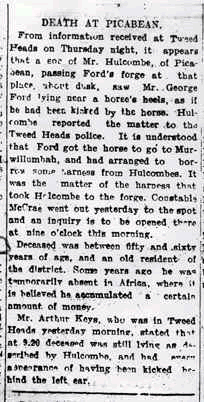 It is understood that Ford got the horse to go to Murwillumbah, and had arranged to borrow some harness from Hulcombes. It was the matter of the harness that took Hulcombe to the forge. Constable McCrea went out yesterday to the spot and an inquiry is to be opened there at nine o'clock this morning. Deceased was between fifty and sixty years of age, and an old resident of the district. Some years ago he was temporarily absent in Africa, where it is believed he accumulated a certain amount of money. 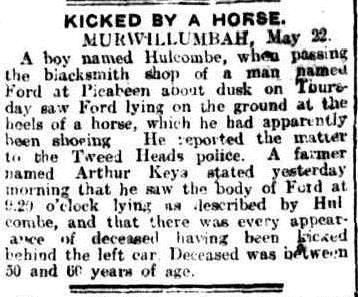 Mr. Arthur Keys, who was in Tweed Heads yesterday morning, stated that at 9.20 deceased was still lying as described by Hulcombe, and had every appearance of having been kicked behind the left ear. The spelling of Piggabeen has been reproduced as per the newspaper report of the day. In 1911, in George Ford's Will, the Solicitors spelt it correctly. The Death Certificates shows that George was from Paxton Berwickshire Scotland and had been in NSW about 25 years and "Not Married" and there were no children listed. George Fords Farm - Queensland Boarder is road on left. Death of George Ford of Piggabeen. A man named Ford, a blacksmith at Picabeen, was found dead in his forge on Thursday evening. Deceased has evidently been kicked by a horse behind the left ear. He was between 50 and 60 years of age. Marie Guthrie Ford (Grandma Richards) had a rickshaw the same as this when we lived at Scarborough in the 1950's. This one has been handed down from Cecelia Ford to her daughter May. The material on this website is for your information only. Whilst we have taken all reasonable steps to ensure the accuracy and completeness of the contents of this website, to the extent permitted by applicable law, the author accepts no responsibility for loss suffered as a result of any reliance on any part of its contents. Peter Richards is not responsible for the content of any linked site changes or updates. Links are provided for your convenience. Inclusion does not imply endorsement. Page Authority 00/100 - Moz Ranking 0.00 /10 - Domain Authority 22/100.